viagra super active no prescription from online drugstore Even though it has only been roughly two weeks since we last updated everyone it feels like a lifetime ago. The absolutely wonderful news is that we have started to achieve what some people would consider a bit of a normal life. We still attend PT and OT appointments once or twice a week as well as go to chemo every week, but it is quickly becoming normal in our lives. Emma has had an great past week or so, the only times we have been in the hospital is to receive her chemo regimen. We have also begun to see a side of Emma that has been gone for what seems a very long time. Tonight for the first time we got to see Emma giggle with her dad and brother being silly. She has been laughing for quite some time but this was a belly giggle that was great to see. viagra wonder drug ethical responsibility of corporations Emma received wonderful news when we went to her appointment last tuesday when they said that her blood counts were so good that they were going to actually increase the amount of chemo. While we were curious as to how it would change her behavior, it was definitely nice to hear them say she was doing better then expected. Her weight and height continue to increase each and every time we go to the doctors and everyone seems to be very happy with her progress. 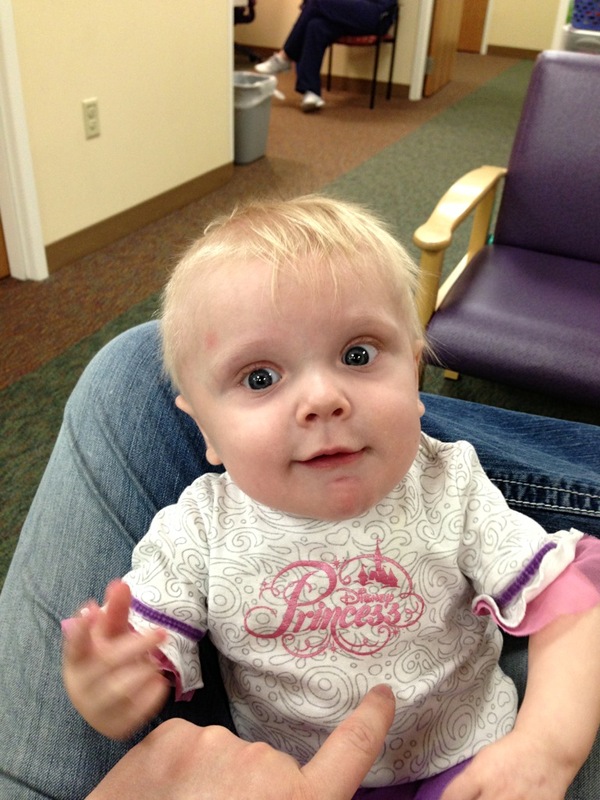 Emma even went to her nine month appointment with Dr. Sindelar and he didn’t give us any bad news for the first time in her life. This made mom extremely happy fyi. Emma continues to make strides with her ability to push up with her arms, sit and play while balancing herself, and increase how long she can stand while holding someones hands. These are all things that we took for granted with Aiden, but appreciate much more with Emma as she fights this extremely difficult battle. http://kaufmanroslyn.com/?x=generic-drug-name-for-viagra Kathryn and I would like to express our most heartfelt appreciation for all the hard work that was put in over the past few weeks by Nate and Tori Oehlrich, Ashley Oehlrich, Jeremy and Amy Killham, Kevin Goering, everyone in the concession stand, and anyone who got teams together or played in the volleyball tournament on St. Patty’s Day. Our family really enjoyed the opportunity to spend the time together and it really helped take our mind off of the tumor for a while. I would like to apologize to anyone that had to watch me play as I am fairly sure I set the game back a few years. For those that are wondering I am still going to the chiropractor to fix the damage I did to my back falling to the floor. I am really getting old apparently. By the way as I type this I have a craving for a Sunrise Burger, any chance you could help me out with that Kevin? We still can’t believe the turnout at Country Shadows that evening as well. As I looked around the room that night I couldn’t believe some of the faces that I hadn’t seen for years. Other things to be thankful for throughout the past couple weeks are the Carriage Hill staff and their participation in the payday luncheon for Emma, Owners and staff of Valentino’s in Columbus for their Emma Day, and the students and staff of the Omaha Westside DECA chapter for their generosity. get link Our family looks forward to some quality family time as well as getting to see friends this weekend at the EmmaStrong Basketball Tournament at Bellevue East this weekend. Thank you to Jordan and Eric, former students of mine, for the work that they have put into getting this organized. I understand and appreciate all the work that you have put in for this weekend. http://travelwithkate.com/?x=viagra-pfizer-canada As my family and I sat in Church on Palm Sunday I couldn’t help but think about everything that our Heavenly Father has given for each and everyone of his children and am eternally grateful for the gifts that he has given to my family past, present, and future. May God Bless during this Holy Week.